The graffiti wall located in Long Island City (LIC) is the premiere graffiti mecca of the world. The wall is located on a factory building that houses 200 local artists, creating the Crane Street Studios. The wall is now considered to be a part of 5Pointz Aerosol Art Center, has contributors from all over the world. It is curated by Robert Cohn, who decides which graffiti artists make it on the “wall of fame”. 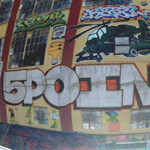 The name 5pointz connotes the 5 boroughs coming together in this malleable mural of art. Today got off to a late start but we were soon cruising in no time. Some kid named, what was it… Feliciano? Fernando? Wait–Felix, that’s it! Joined us for the first time since the time trials. We headed south on the East River bike path and after a quick pitstop to refill our water bottles, and the obligatory photo shoot at the dog run, we conquered the Queensboro Bridge. IT WAS HUGE! But the kids managed it like champs and once we were at the top, we took a look over Roosevelt Island and a beautiful view of the city. It was all downhill from there (literally) as we glided into Queens to check out the graffiti mecca. 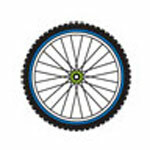 On the way we met a couple folks from Recycle-A-Bicycle–nice to see some fellow riders on the road! The graffiti was amazing, and a great opportunity for photo ops. The heat got the best of Jasmine, but she hung in there and got herself back. Next time we’re going to focus on drinking lots of water! When we got back, we only had time to upload our pictures quickly but in the coming days, we will work on editing them. Great ride today guys!! Today was such a fun day I enjoyed it A LOT not only getting to see that wonderful landmark up close but the commuting went very smoothly today i loved it. felix’s first and last trip . that fraud!